David Wilson North Midlands is celebrating after a new phase of homes have been released at its popular Newton Grange development on Bridge End in Colsterworth. Plots four to 11 have now been released for sale and offer a selection of four- and five-bedroom houses, in six different home styles. Purchasers will, therefore, be spoilt for choice and this is a great time to find the perfect family home. James Poynor, Sales Director for David Wilson North Midlands commented, “Newton Grange is a quiet development in the rural village of Colsterworth and it is this along with the excellent selection of properties that has made it such a success since its launch. “We are experiencing a large number of enquiries from interested purchasers; therefore I am delighted to be able to announce that we are releasing this brand new phase of four- and five-bedroom houses. These eight homes are also available to buy with David Wilson’s popular part-exchange scheme, which offers homebuyers a stress-free way to move home. With the scheme all purchasers have to do is reserve their preferred plot, David Wilson will then arrange for two independent valuations of the existing home after which a fair market value will be offered. Once this has been accepted and the new home complete, purchasers are free to move in. James continued, “Part-exchange is the ideal way to move to a larger home in one easy step. Not only does it relieve some of the stress of having to sell a home, but there are no estate agent fees and because we are effectively a cash buyer, there is no worry about the chain falling apart at the last minute. The only criteria a purchaser has to meet in order to use the part-exchange scheme is that the existing home is worth no more than £250,000 and that it is no more than 70 per cent of the value of the new home. Colsterworth village centre is just a few minutes walk from Newton Grange and offers plenty of amenities such as a post office, Co-op store and traditional village pub. Leicester, Sleaford, Newark and Nottingham are all accessible from the development, making it a great choice for families who are looking to live in a quiet location within good commuting distance to bigger towns and cities. 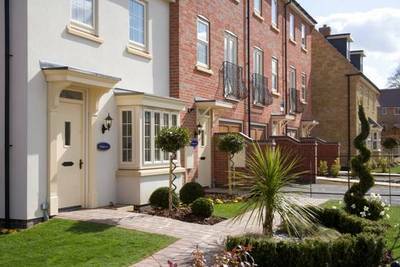 Newton Grange offers a selection of three-, four- and five-bedroom houses. Prices start from £171,995. For more information log on to Dwh.co.uk.